Connoting victory at war, this statue of Kwan Kung depicts him wearing his favorite war robe and holding his "Kwan Dao" confidently. Held behind him are the 5 Victory flags inscribed with dragon images. The five flags represent the power harnessing from all the 5 Elements. He has a total of 9 dragons surrounding him which blows ultimate cosmic forces for better empowerment. A strong charactered Kwan Kung like this is most suitable for business empowerment, political enhancement, wealth increment, family achievement, career soaring and network expansion. 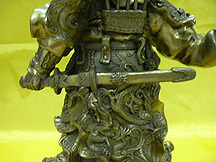 In terms of protection, the statue will stand against all odds, evil forces and bad stars. 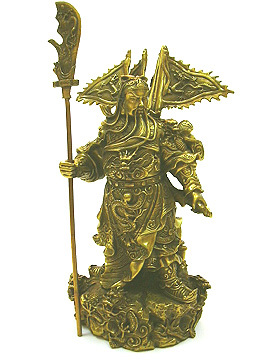 The statue is best placed to face your maindoor or entrace of your offices. The deity will put a hardstop to competitors or trouble-making enemies wishing to harm you. What Kwan Kung symbolizes and how to place this deity? Kwan Ti (later known as Kwan Kung) is the most famous war general in the history of China. He is perceived as the grandest military hero who lived during the popular era of Romance of Three Kingdoms under the Han Dynasty over 2000 years ago. Centuries after centuries after his death, he continued to be a powerful figure known for his protective qualities of the nation and country till he was elevated to the rank of God of War in 15th century because of his righteousness, becoming one of the most popular deities in China. In the heavenly realm, He was chartered to take care and guard the Buddhists texts, being the reason why the Kwan Kung images always appear in almost all temples. He normally appears alone or with his two assistants. His image could be found globally at home, office or business premises of Feng Shui enthusiast, as he aids those in need of assistance for various trades and professions. Because almost all businessmen regarded the Kwan Kung to provide blessings in money making and almost all trades, He later was also known as God of Wealth and God of Literature. Kwan Kung embodies power, honesty, righteousness, scholastic ability, strength, integrity, and honor. Kwan Kung not only provides a strong force of protection, his presence brings about fortune, wealth, grandeur, fearlessness, competitiveness, status and confidence. Kwan Kung is feared by all evil and revered by all who are sincere at heart. Kwan Kung protects the righteous and defends the innocent. No spirit would dare to enter homes or premises when the Kwan Kung is present. The Kwan Kung usually wears his military uniform with embroidery of the powerful Dragons. Kwan Kung has a red face as his famous identity, always look confident, usually victorious and normally fierce to scare away the evil spirits and opponents. His most powerful weapon is the "Kwan Dao" (the battle knife), a special knife in which only the Kwan Kung used and no one else. Kwan Kung having dragons around him makes him even more powerful. The most powerful form of Kwan Kung is the "Victory Kwan Kung", shown to have 5 dragon flags behind him and him standing on five dragons. There are many roles in the Kwan Kung and therefore bring multiple advantageous to have him in the house, office and business premise. 1. Display the Kwan Kung image in the home facing the front door to provide strong force of protection and counter any killing breathe, negativities or evil that is entering the house. They will be scared away. 2. 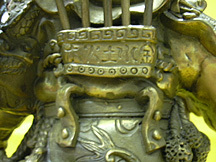 The Kwan Kung made from bronze could be placed in the Northwest corner of the house because it is the metal corner and represents the partriarch luck. This will trigger mentor luck, extreme support from authority and helpful people coming your way. 3. At work, place the Kwan Kung image behind where you sit at work for retention of power and status. This position is most suitable for managers, leaders, executives and politicians. For employees of big firms, the powerful protector on your desk or behind you will keep away backstabbers and deceivers. 4. The Kwan Kung is also the most important figure in offices of police forces and triad members in Asia to ensure victories in pursues. He is highly respected and worshipped by them. 5. For businessmen, the Kwan Kung is a must in business premises or shops facing the entrance at reception to assure themselves victory in competitive businesses and protection against problem makers. The Kwan Kung protects the entity from fraud and embezzlement, promotes loyalty and ensures smooth sailing. This is believed to help the business prosper even against overwhelming odds. The Kwan Kung is also placed in the staff area of offices to promote unity, loyalty and honesty of the employees. 6. The Kwan Kung made of metal/bronze can also be used to diffuse 5-yellow star (bring fatality and bad luck) and star-2 (bringing illness). Note: It is not advisable to place a deity in the bedroom or kitchen.